Our staff have embraced the opportunities presented to enhance development works through incorporating environmentally sensitive design. There is often an improvement in amenity value of the completed project in addition to an improved outcome for the environment. The traditonal approach of piping stormwater as quickly as possible to lakes, rivers or the sea has been replaced by a desire to provide treatment of stormwater to improve the quality of water being discharged into the receiving environment. Local Authorities are now accepting non-traditional methods of dealing with stormwater, which in addition to improving water quality, may also allow less costly stormwater reticulation to be installed. Low impact design and innovative stormwater treatment methods provide the opportunity to incorporate landscaping to improve amenity values. Staig & Smith have been involved in the design and implementation of many initiatives incorporating environmental values. Involvement in the restoration of a compromised wetland through installation of culverts beneath a causeway to reinstate natural flows and address eutrophication of the water body. Culvert outlet levels and the large diameter of many culverts can prevent fish passage throught interruption of a continuous stream of water or inadequate water depth. Staig & Smith have designed and supervised the installation of fish passages as part of subdivision works. Staig & Smith staff have been involved in the rehabilitation of Reservoir Creek through our Community Support programme and voluntary time provided by staff members. 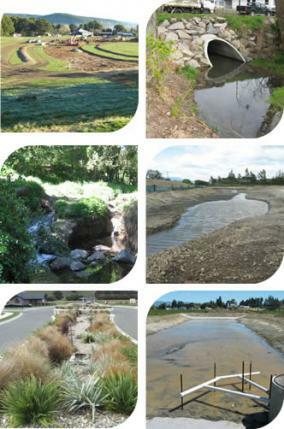 Stormwater detention systems are employed to limit peak runoff flows during high intensity rain events with benefits in reducing downstream reticulation capacity, along with reduction of potential erosion. We can assist with sizing, design and landscaping of stormwater detention systems. Swales and rain gardens are gaining acceptance as stormwater treatment methods. Contaminants contained in run-off can be trapped by vegetated swales and rain gardens leading to improved water quality at the point of discharge. Staig & Smith have been early adopters of these methods and belong to the NZ Water and Wastes Association. Earthworks can lead to sediments being carried off site suspended in run-off. Earthworks consents now generally contain a condition requiring an Erosion and Sediment Control Plan (ESCP) to be submitted to the Local Authority for approval prior to the start of works. Staig & Smith have regular dealings with Contractors and Councils over the preparation and approval of ESCP plans. Catchment modelling can be a complex exercise to assess contributing areas and their appropriate run-off co-efficients and time of concentration. Our 12d software allows efficient modelling and analysis of catchments.